Iowans are one step closer to learning how far former Board of Regent President Bruce Rastetter diverged from the University of Iowa president search process he put in place, and whether he and complicit regents will face consequences for mocking open meeting laws. 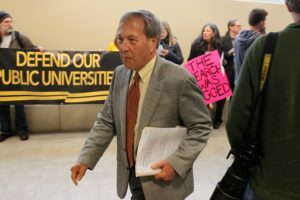 The members, who constitute a majority of the board tasked with overseeing Iowa’s public universities, had to describe under oath their role in the covert recruitment in 2015 of UI President Bruce Harreld. Secret meetings — which then-Regent Katie Mulholland described as “coordinated in such a way as to avoid the requirement that they be public” — took place weeks after the regents announced a transparent search process, but only hours before Harreld made official application for the job. In addition to Mulholland, Harreld met in private with former member Mary Andringa and current Regents Milt Dakovich and Larry McKibben. Rastetter arranged two meetings, each attended by two regents, using his private email. He acknowledges the meetings were intended to recruit Harreld for the position, but contends he did not view the situation as “an official board matter” subject to Iowa meeting laws. Earlier meetings arranged by Rastetter, which Harreld has said provided him an opportunity to meet with then-interim UI President Jean Robillard (who also led the public 21-member search committee) and Vice President for External Relations Peter Matthes, were not included in Rastetter’s deposition. Likewise, neither was a Rastetter arrangement to connect Harreld and then-Gov. Terry Branstad by phone. New details regarding the secret meetings — preferential treatment provided only to Harreld — are courtesy of a Polk County lawsuit brought by UI alumn and former administrator Gerhild Krapf. It’s a court case the state has attempted to squelch once, and it will try to stop again at a hearing this week. In this instance, let’s hope the state fails miserably. Iowans should know if people appointed by the governor and confirmed by the Senate are good stewards of public trust. When questions of integrity arise, answers are a necessity. Sadly, there is no vehicle outside the courts with the authority or political will to investigate and provide the answers the public needs. The public search process announced by the regents and paid for by taxpayers was an expensive sham. Faced with the option of conducting a wholly secretive but widely unpopular process, the group gave lip service to transparency and proceeded covertly. Understanding that does not lessen the need for Iowans to pore over autopsy results; it doesn’t erase the need to prevent another debacle. Iowans must know how and when public trust was violated, so they can best determine if those involved are worthy of their appointments. If the UI presidential search process was the result of cronyism — which I believe it was — Iowans deserve an opportunity to better scrutinize Regent President Mike Richards, a key political donor who met with Branstad days before Andringa submitted her resignation and who was appointed to the board two days afterward with no public call for applications. Regent actions have been a disservice to Iowans, Iowa City, the UI, the three academics publicly announced as presidential candidates and, especially, Harreld. They’ve resulted in votes of no confidence and national censure. When frustration bubbled over, the two public servants at the center of the controversy offered rebuffs. Branstad told UI faculty members to “calm down” when they demanded he replace regents, and lied about his authority to do so. Rastetter said an audience that interrupted and shouted at Harreld during a forum should “be more professional” in reaction to the forum’s “spirit of open transparency” — as opposed to Rastetter-sanctioned closed transparency. At every turn, instead of acknowledging mistakes and apologizing for wasting taxpayer resources and the time and talents of those who served on the search committee, Iowa leaders have attempted to dismiss or demoralize those questioning the process. Their words and actions make clear that full disclosure will take place only when a court demands it, and such disregard will stop only when exposed to the sanitizing light of public scrutiny.